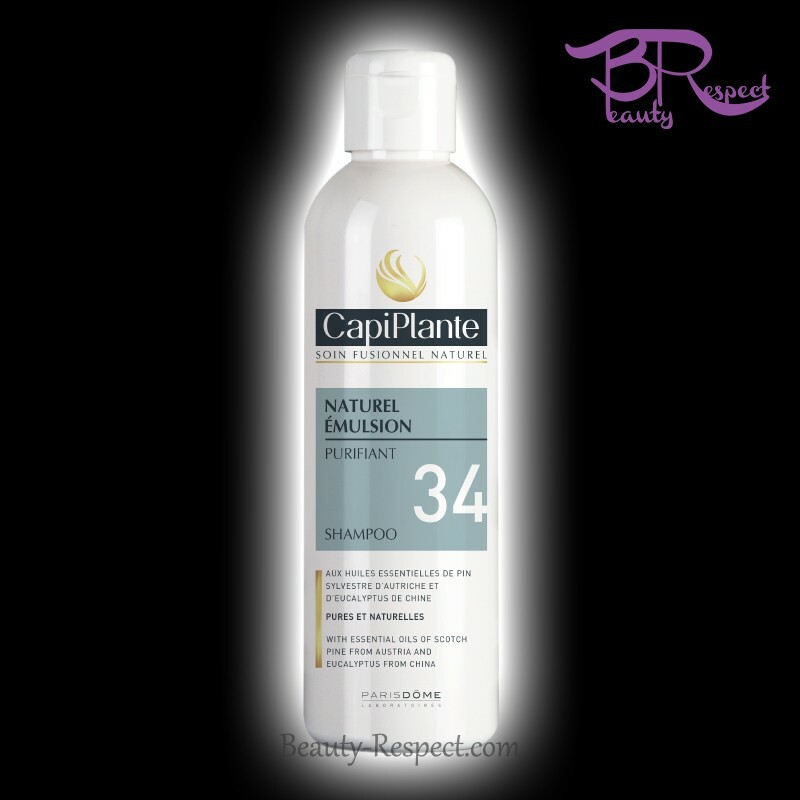 CapiPlante Naturel Emulsion Purifiant n°34 is for oily hair associated with dandruff with or without excessive sweating. 100% pure and natural essential oils Bitter Fennel and Spanish Cypress. Properties Sanitizes, regulates the production of hyper sebum and dandruff and balances the scalp. CapiPlante Naturel Emulsion Purifiant n°34 is for oily hair associated with dandruff with or without excessive sweating. It cleanses, regulates the production of hyper sebum and dandruff and balances the scalp. For optimum treatment, we advise you to associate it with the CapiPlante Capidouche of your choice. 100% pure & natural essential oils: Bitter Fennel and Spanish Cypress. The essential oil of Cypress has balancing virtues to rebalance the hyper sebum. Apply Capiplante Capidouche of your choice, Foam, massage gently. Rinse. Then apply CapiPlante Naturel Emulsion Purifiant n°34 on the hair as a shampoo with a time of exposure of 3 to 12 minutes to properly clean the scalp, take the opportunity to do something else, then rinse thoroughly. Guaranteed paraben-free, preservative-free, non-ionized, fragrance-free, color-free and untested on animals. CapiPlante is a brand of natural cosmetics, expert in the scalp, hair and skin. First natural fusion treatment, thanks to the bioactivity of essential oils, 100% pure and total. CapiPlante has developed highly effective skincare programs that also offer a unique sensory experience. It is at the time of care with a tailor-made program and after a review performed by professionals of the hairdressing and the aesthetics, that the natural assets of CapiPlante release their fusion capital, thus allowing the scalp, the hair or again to the skin to regenerate in a natural and complete way. At the origin of this fusional capacity are the naturally bioactive molecules present in essential oils. In some combinations of essential oils, there are up to 150 different molecules. It is these molecules, in combination with other natural assets, that give CapiPlante its healing power.